I will have to procure a usb to sata adapter to connect the sata drive to my Laptop for executing above maneuver, which I will order. Is there an alternate way to copy the required rootfs files without having to physically remove the drive from Goflex-Home box? I was wondering since I can access the sata drive which is running on Goflex-home box, via ssh as root from laptop running mint, is it possible to just copy the fresh rootfs file to the appropriate directory on the sata HDD and untar it, enter the required parameters, remove the Boot USB from GoFlex-Home Box and reboot, hoping that fresh rootfs on sata will take over? 1) Login as root on different Linux machine. 2) Download and Copy Debian-4.12.1-kirkwood-tld-1-rootfs-bodhi.tar.bz2 to appropriate directory of Sata HDD attached to GoFlex-Home Box . 3) SSH via terminal to Goflex-home box which is booting from usb drive and login as root. 4) Untar this Debian-4.12.1-kirkwood-tld-1-rootfs-bodhi.tar.bz2 file to the same directory. 5) If needed make any configuration changes to boot from this new HD drive. 6) Shutdown the Goflex-home box. 7) Remove the usb flash drive from Goflex-home box. 8) Reboot the Goflex-home box. 9) Hopefully boot into a fresh Debian install running on Gflex-home sata. 10) Freshly install needed apps i.e. samba, transmission etc. Edited 1 time(s). Last edit at 02/03/2019 10:40PM by Navi. Yes. If it is the fresh rootfs then sure, it will work. Your steps look good except step 4. 4) Untar this Debian-4.12.1-kirkwood-tld-1-rootfs-bodhi.tar.bz2 file to the top directory. Assuming the HDD is mounted at /media/sda1. That worked. Now I am booting from HDD. 1) Should I upgrade to linux-4.20.6-kirkwood-tld-1-bodhi.tar.bz2 ? 2) Is it possible to use some kind of splitter on Sata port to attach two HDDs to GoFlexHome? Edited 2 time(s). Last edit at 02/04/2019 11:45AM by Navi. Yes. There are a lot of benefits in running the latest kernel. > Sata port to attach two HDDs to GoFlexHome? What you can do is to connect a SATA to eSATA cable, and use an eSATA enclosure for 2 HDDs. then changed default download location of transmission to /DataDisk1/Tdownloads. Used Transmission to successfully downloaded torrent to this location. Now I can do anything I want in this folder from windows system. But was wondering how secure this setup is and if it is exposing my GoFlexHome box and network to unnecessary online risk? > and network to unnecessary online risk? There is no online risk with Samba. It runs in your local network. As long as you don't open ports in your router (to access your home network remotely through the internet), then it is OK.
3) Customize LED lights. (would love to see Bluish-white light when HDD is up and running. Any wiki on this?). Edited 1 time(s). Last edit at 02/06/2019 10:09PM by Navi. > 1) Power Saving Features. > 2) GUI interface. ( Do you recommend XFCE? Yes. XFCE has low memory footprint. So add the above line to /etc/rc.local. Depend on the usage. If running XFCE GUI, swappiness 10 is recommended. If not running any remote desktop, use default swappiness of 80. Installed XFCE as instructed on the wiki ( https://forum.doozan.com/read.php?2,21784 ). I am using RDC on windows 10 machine to connect to goflexhome box. RDC initial Connection/login window does not offer option for sessman-xvnc. It just wanted Server name or Ip along with username and password. When I connect to Goflex home all I see is black/gray screen. Session: Xorg, Xvnc, Console, vnc-any, sesman-any, rdp-any, neutrinordp-any. I have tried all but nothing works. What am I missing? Should I have implemented some prerequisites before installing xfce? I also installed tightvnc viewer on windows 10, tried to connect, but connection was refused. Edited 2 time(s). Last edit at 02/08/2019 07:23AM by Navi. I have not run XFCE desktop on these plugs for quite a long time. So not sure what you are seeing. Am I safe in assuming that above commands have successfully changed HD spindown time to 21 minutes and that this setting will be retained even after reboot? hdparm sets the spin down period permanently. So the second command (:~# hdparm -K 1 /dev/sda) was unnecessary? Is there a way to reverse the changes that happened because of executing it? How to confirm if the changes of first command (~# hdparm -S 255 /dev/sda ) are working? I can feel the drive and it has slight vibration even after 30 minutes. If your Debian root file system / swap is on sata drive, then sata drive is accessed often and it won't be able to power down. Change them to a small USB drive and then you can feel hdparm working on sata. Thanks Daviddyer for pointing that out. My box is booting and running from the HD, so I guess there will be no benefit from( hdparm -S 255 /dev/sda) command. I was planning to leave the box on 24X and hoping for some HD power/life saving features would kick-in. Just upgraded Kernel to linux-4.20.6-kirkwood-tld-1-bodhi.tar.bz2. (1) after the upgrade, I still see old kernel files! Below is the listing of files in /boot directory. Is this normal? Should I delete old files manually or leave them there? (2) Also here is the printout of the upgrade process: (Should I be concerned about Highlighted lines?) Everything seems to be working ok. Selecting previously unselected package linux-image-4.20.6-kirkwood-tld-1. Edited 1 time(s). Last edit at 02/11/2019 07:41AM by Navi. Those are just warnings, you can safely ignore them. Do the same for kernel headers. However, I would keep at least 2 working versions, in case you need to boot back to an older but working kernel, because the new one is broken for whatever reason. However, simply installing the firewall did not turn it on automatically. This allowed free access from my subnet to everything on my GoFlex box. That is it, now I have a secure GoFlex Home Box that I can freely access from my network! I am not sure if ufw was needed but I feel good after having installed it without a glitch. > name or Ip along with username and password. > I have tried all but nothing works. > connect, but connection was refused. Got VNC to work from windows on my Goflex home box. 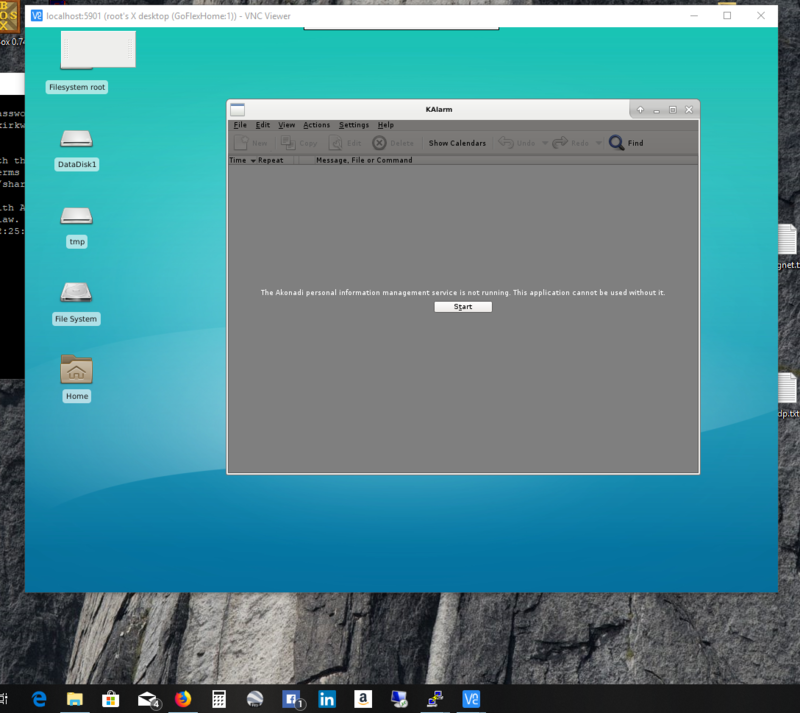 restarted vncserver and then connected from windows 10 system using vnc viewer from real vnc and ssh tunnel in putty. and it worked!!! I am attaching the screen shot. Edited 1 time(s). Last edit at 02/17/2019 11:16AM by Navi. It's basically the same packages being installed. The dependencies brought in all necessary packages this time. Now this is interesting! it means there was some changes in X11. > and ssh tunnel in putty. Hello bodhi ! I just learned about linux. Can you tell me how to install the debian operating system on a goflex home device? Because I don't know where to start. Thanks so much ! I will follow each step below right? Do you have any special instructions for goflex home ? Thanks Admin Bobhi !!! on that page just go to the "Updated 24 Jul 2017" and follow the instructions for that update. If you will be upgrading your box from Stock OS then first you need to go to https://forum.doozan.com/read.php?3,27280 and download the U-Boot flashing utilities from the link provided on that page and place these files in Stock OS directories as mentioned in the post. Whole process is very easy, once you get the hang of it. Don't hesitate to ask questions. Have you already accessed your GoFlex_home using ssh? ok Thanks My friend ! Edited 1 time(s). Last edit at 03/01/2019 10:05AM by pigbone. > on that page just go to the "Updated 24 Jul 2017"
> and follow the instructions for that update. > in Stock OS directories as mentioned in the post. > of it. Don't hesitate to ask questions. Please confirm the platform you are executing step 1 on? are you using a system with linux? I used a desktop running Mint 19 Live to execute the procedure to make bootable debian rootfs USB. Step 1 procedure can be done without having the Goflex_home box involved. Edited 1 time(s). Last edit at 03/01/2019 11:47AM by Navi. Hi My Friend !! I tried a lot of ways and still couldn't do it. I see on the page https://archlinuxarm.org/platforms/armv5/seagate-goflex-home very detailed instructions on installing Goflex home products. Can you guide me to install debian like this? I am available at donate floor 10-20 $ for your help. Edited 1 time(s). Last edit at 03/01/2019 12:57PM by pigbone. The installation process link you provided for archlinuxarm installation uses Stock OS of Goflex home. I am not sure if that can be done for Debian version of Linux. (Bodhi may have more insight into this). In our case we are going to first make a Debian Bootable USB on independent computer running linux. I am assuming you have access to a laptop running windows, therefore download linux mint or ubuntu and make a bootable live usb to run a mint or ubuntu live session. 3.) boot your Laptop using this Live USB. (After you have booted into Mint Live USB, make sure your Laptop is able to connect to the local network and internet either using wifi or LAN port on your Laptop). 7.) Now plugin the USB stick you want to install debain rootfs on (into second USB port, do not remove Linux Live USB Stick) and follow the steps you were trying to do before. BUT FIRST: Since you will be upgrading your GoFlex-Home box from Stock OS, you need to go to https://forum.doozan.com/read.php?3,27280 and download the U-Boot flashing utilities from the link provided on that page, then SSH to Goflex_Home Box and place these files in Stock OS directories as mentioned in the post. Edited 5 time(s). Last edit at 03/02/2019 10:33PM by Navi. Hi Navi ! Thanks your support me ! At step 8: I still steal the usb to my laptop or plug in the goflex. Can you tell me more about this step ?